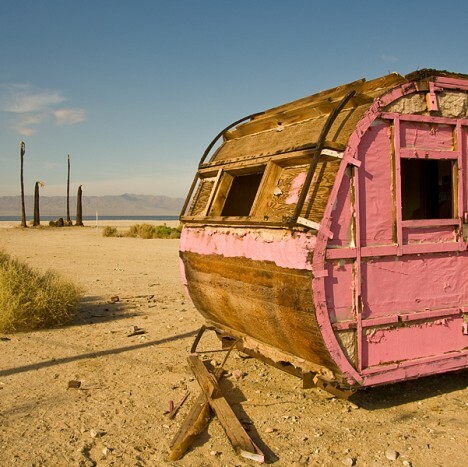 California’s Salton Sea was once a sparkling desert oasis, attracting vacationers in mobile homes and RVs. The people have gone but their trailers remain. 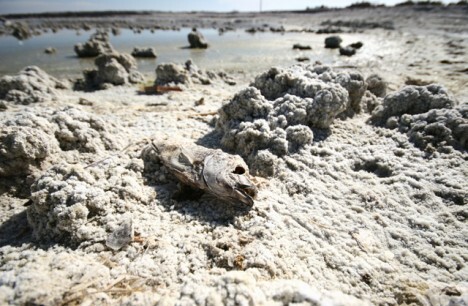 Located in Southern California’s Colorado Desert, the Salton Sea was created inadvertently in 1905 when a “perfect storm” of heavy rains and ill-advised construction of irrigation canals allowed the mighty Colorado River to divert into the bone-dry Salton Sink. Though saltier than the Pacific Ocean, the resulting below-sea-level lake sparked a development boom that included resorts, marinas and trailer parks. 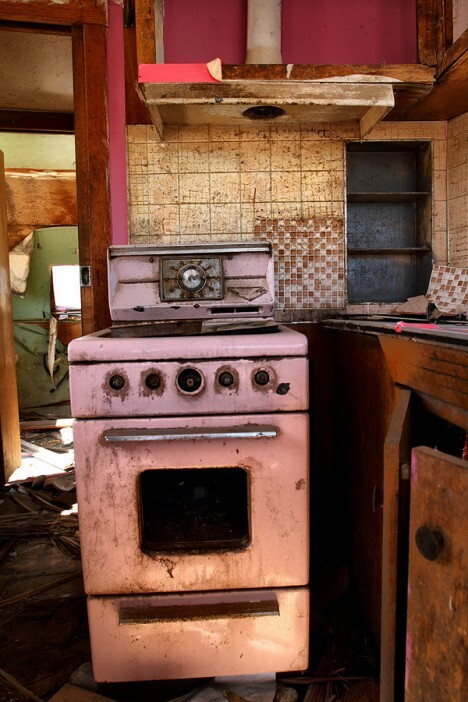 By the late 1950s, however, increasing pollution and a series of massive (and massively smelly) fish die-offs took the bloom off the rose – the number of visitors and residents dropped while many of those who left the area left their unwieldy trailers behind. 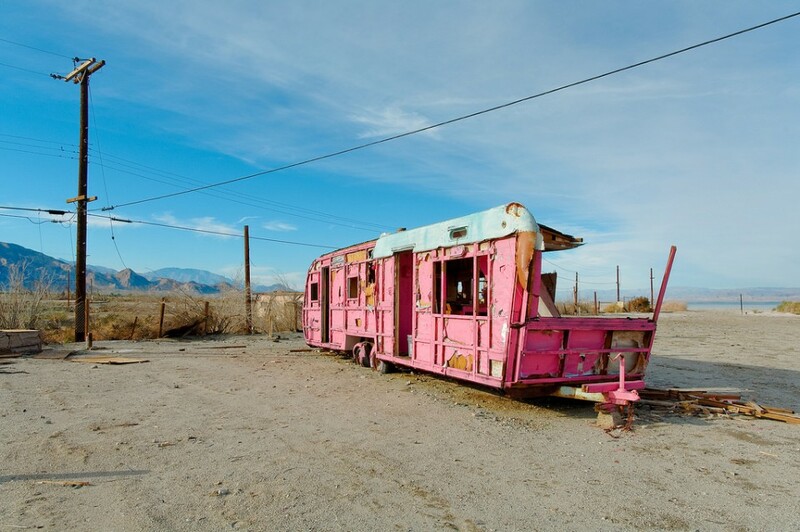 Some of these long-abandoned trailers have achieved an unlikely sort of fame as photographic subjects – as symbols of post-apocalyptic failed consumerism, they can’t be beat! 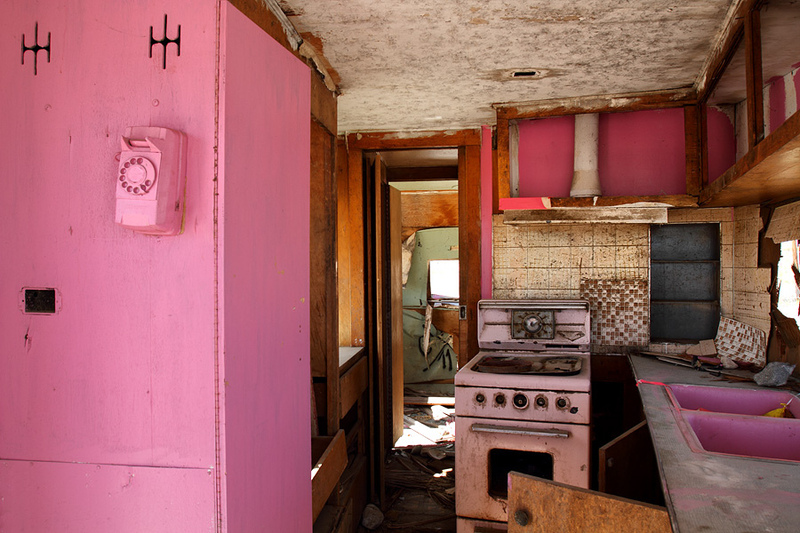 One of the most well-known abandoned Salton Sea motor homes is the very pink (even the kitchen sink is pink!) trailer photo-documented above by Flickr users nate2b and jawbox57. 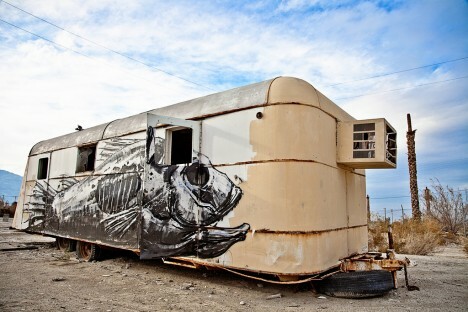 There are dozens – possibly several hundred – abandoned trailers scattered around the receding shores of the Salton Sea though very few are as artistically decorated as the rather “fishy” example above. 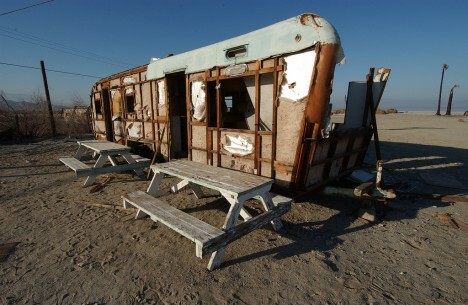 Flickr users Jamie Valenta (Jamie V Photography) snapped the Tilapia Trailer in February of 2011 while Erin Yamagata captured one of many possible inspirations on a salt-encrusted beach in January of 2010. 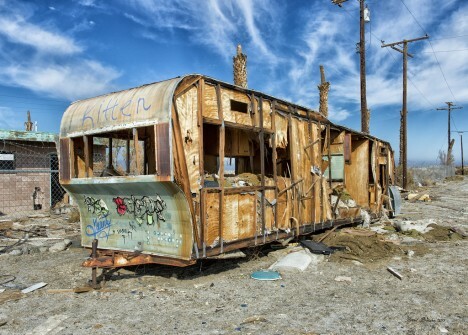 You won’t see much graffiti of any type on these abandoned Salton sea trailers but that’s not to say they’ve never been tagged. 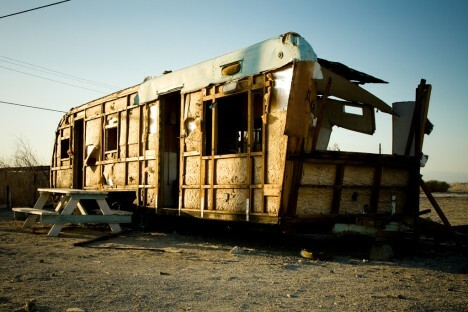 In recent times, metal scavengers and scrappers have been busily stripping away the siding from countless old trailers including the once-impressive RV above. Meth: it’s a hell of a drug. Kudos to Flickr users Hans Proppe (shadowplay), Brent (brentus69), and Patrick Maloney (analog_chainsaw) for stopping to snap instead of strip.